St. Etchmiadzin was founded in 301 and built in 302-303 with the patronage of Kind Dertad Ill and nobility, and the enthusiastic support of the people. The history of Etchmiadzin is among the most poignant of the writings of Agathangelos, for in it he extols the capabilities, will, and great accomplishments of a people when working in unison. According to tradition, the site of the Cathedral is the location where Noah disembarked from the Ark and praised the Lord. In following years, pagan temples were built on the site. Initially, the newly built church is dedicated to the Holy Mother of God and thus called St. Mary (Soorp Asdvadzadzin). However, for the masses it soon becomes a living symbol of the awe-inspiring vision of St. Gregory, and becomes known as Etchmiadzin, and also becomes the site of the Holy See. Known for centuries as Vagharshabad, and also New City (“Nor Kaghak”), the people rename the city Etchmiadzin. In due time, it becomes regarded as a holy and hallowed city. St. Gregory had already foreseen that it was to become “A House of Prayer”. Considering the religious nature of the city, under Ottoman rule it was also called “Ooch Kilisa”, meaning “City of Three Churches”. 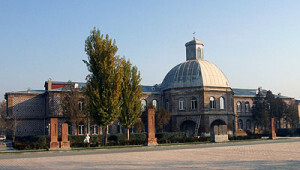 At present, the renovated grand Mother Cathedral with its vast expanse encompassing the residence of the Catholicos, various Holy See departments and offices, memorial monuments, Gevorgian Theological Seminary, the planned Catholicos Karekin I religious-educational center, museum, printing house, communication mediums, and other departments, is an important spiritual center and sacred pilgrimage site for the Armenian people. Its status as an eminent religious center is further cemented by the fact that when visiting Armenia, Presidents and high ranking dignitaries of other nations meet with the President but also visit Etchmiadzin to meet with the Catholicos of all Armenians. It is noteworthy also that since the independence of the second Republic of Armenia, elected Presidents visit Etchmiadzin to receive the blessing of the Catholicos. The tradition honors the collaboration between the head of state and the head of the Church, in the example set forth by King Dertad Ill and St. Gregory the llluminator. 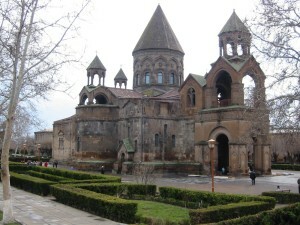 Without a doubt the Feast of Etchmiadzin is celebrated with great ceremony for it is the first Christian Cathedral of the Armenian people, established by the luminous guiding rays of God, and because it is not only the site of the Holy See but a symbol of the Armenian people’s profound senti­ments towards their faith. The historical significance of Etchmiadzin is recognized on an international level as well, for in religious history it is widely accepted as fact that in the year 301 Armenians became the first Christians, based on having adopted Christianity as the official state religion and on the occurrence of the vision which would lead to the establishment of the Cathedral. The realization of Etchmiadzin was made possible by the collaboration between King Dertad Ill and St. Gregory the llluminator. The Apostolic vision, unwavering struggle, and life of St. Gregory as a figure who forged history is recorded beautifully in the first historical volume on the Armenian people written by world-renowned writer Agathangelos. In the world of historical writings, the volume, which is translated into numerous languages, has become the most captivating ancient work and subject matter. This important work of Agathangelos encompasses the reign of the Persian Sassanid dynasty beginning in the early third century, around the year 226, until the last years of King Dertad Ill in the first half of the fourth century, around the year 330. The book is titled “History of the Armenian People”, but given that much of the content focuses on St. Gregory’s apostolic mission, Christian teachings, torture, holy vision, unwavering efforts, and the events surround­ ing the martyrdom of the Hripsimian and Kayanian saints, Armenian and for­ eign historians alike have called it “The Works and Life of St. Gregory”. Let us note also that all Apostolic Churches, whether Orthodox or Catholic, evoke the name of St. Gregory during Holy Mass, as one of the greatest figures in the spread and strengthening of the Christian faith. The two most important figures of the time, St. Gregory the llluminator and King Dertad 111, who created a turning point in the history and religious heritage of the Armenian people, came from two different paths of life, though both were orphaned at a young age. 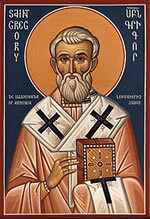 Anak was the father of St. Gregory the llluminator, or Gregory Barthev (Gregory the Parthian). 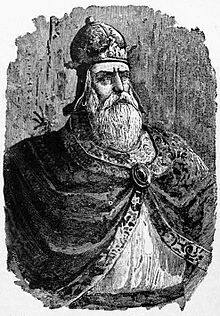 He is sent to Armenia by the Sassanid dynasty to kill the Armenian King Khosrov I of the Arshagouni dynasty, who was viewed as a dangerous adversary to the Sassanids. Anak, feigning persecution, goes to Armenia seeking refuge. He is welcomed by King Khosrov I and lives in the royal palace for a long time, gaining the trust of those around him. At an opportune time, he succeeds in carrying out his mission; he kills the king and members of his family, and tries to escape to Persia to receive his reward. Khosrovitoukhtt is freed by Prince Oda Amadouni. Anak is unsuccessful in reaching Persia after committing his crime. King Khosrov’s faithful soldiers pursue the fugitive and are able to apprehend him. They kill members of his family, of whom only one survives, the young Gregory, who is taken to Caesarea probably by a wet-nurse. Dertad, with his military training and physical stature, achieves a high rank within the Roman army. He participates in various battles. When Emperor Aurelius battles against the Persians, in the years 274-276, Dertad plays a decisive role in the victory. Thus, the Emperor hands over the rein of Armenia to him. 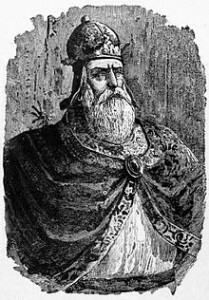 In 287, Emperor Diocletian officially proclaims Dertad the Armenian king. Let us note that in those days, Roman Emperors aggressively persecuted Christians. The same policy against Christians was implemented in Armenia as well, at least into the early fourth century. Gregory completes his education in Caesarea, where he excels in Greek and Assyrian literature. He marries Mariam, the daughter of a Christian man named Tavit, and they have two children, Vertanes and Aristakes. When the kingdom is reinstated in Armenia, Gregory leaves for Armenia to serve his homeland, and possibly even to make amends for his father’s crime in killing King Khosrov I. It is noted that when the Roman army was fighting against the Persians in 274-276, Gregory had already joined the Armenian army and was working together with Dertad. Dertad, extolling the glory and greatness of the goddess, invites Gregory to participate in worshipping Anahit. Gregory declines the invitation, stating that God commands obedience to earthly rulers, but only He can be glorified and worshipped, for God is the only creator of the heavens and the angels. Dertad and Gregory argue their viewpoints, one in favor of the pagan gods, the other in favor of following God’s Word, as a true Christian. Despite Gregory’s productive and loyal service to the army and to Dertad, in order to maintain power and credibility Dertad orders that his will be done. Gregory is subjected to the most severe punishments of the day. He miraculously survives the tortures and is eventually taken to Artashat and thrown into a dungeon reserved for those sentenced to death. For nearly a decade Dertad battles with the Persians, until a ceasefire proposed by King Nerseh ushers in a long period of peace and rebuilding in Armenia. Dertad marries my Ashkhen, daughter of King Ashkhatar of the Alans. Coming back to Gregory, it seems that everyone had forgotten that he was still in the dungeon. Tradition states that a righteous individual provides him with daily bread during his entire imprisonment. Meanwhile, Gregory, with his staunch faith in God, always kept hope that one day justice would prevail and the royalty and people would receive the Truth and Light of righteousness. At the start of the fourth century, an appalling and inhumane occurrence shatters Armenia’s peaceful facade. Due to religious persecution, the Kayanian virgins, among them the beautiful Hripsime, seek refuge in Armenia. The settle in the region of Vagharshabad. The presence of the pure Christian virgins would not remain a secret for long. Armenia had a policy of persecuting Christians just as Rome did; so much so that those who would expose a Christian would be rewarded with royal gifts. The virgins are taken to the royal palace and advised to return to idol worship. But to no avail. When they fled Rome they had pledged and prayed for the Lord to strengthen them in their oath, to keep them on their righteous path, and for their eyes to never be blinded to His Truth. Having exhausted all means of convincing them, Dertad orders their execution. The bodies of the innocents are laid around Vagharshabad. Prince Oda Amadouni is given the responsibility of going to Vagharsahabad to free Gregory from the pit. Years earlier Khosrovitoukht had wit­nessed the punishments meted out to Gregory. She had felt remorse and was likely the individual who had taken him food everyday. Oda Amadouni fulfills the task entrusted to him. King Dertad and the people come face to face with a fatigued Gregory. Dertad asks for forgiveness for the suffering he caused, to which Gregory replies that he must recognize the one true God of heaven and earth, for He is the only One who can offer forgiveness and cure him. The people feel a sense of relief. Gregory immediately inquires about the martyrdom of the Hripsimian and Kayanian virgins, whose bodies had for the past nine days remained unburied nearby. Proper arrangements are made. We have presented excerpts of this dialogue because they are the commencement of Gregory’s mission. The spiritual transformation of the royal family, princes, and ministers and the positive view of the new faith was already underway. Gregory’s unwavering faith during the thirteen to fifteen years he endured in the pit was a triumph for the Good News and Truth of the Bible, which was spreading among the people and becoming a reality in their lives. For years that had been Gregory’s dream; finally a favorable atmosphere was created and it was time to begin his mission. Martyriums are immediately constructed where the souls of the martyrs can finally rest in peace. Among them are the Hripsimian and Kayanian martyriums. The King and the royal assembly bring gifts of perfumes, incense, garlands, golden silk cloths, and pure white garments as a tribute to the saints. Gregory remains at the site of the martyrdom for 65-66 days straight, fasting and preaching. The King and royal assembly follow his sermons. The people hear the teachings of the Bible about goodness and love. The King closely collaborates with Gregory, who having put aside his decade-long torture, tenaciously and ardently preaches and inspires hope, and tells of his vision. Gregory’s vision was like a catalyst. Immediately after, the king, royal assembly, and the people enthusiastically delved into the construction of churches. The foundation is set for St. Etchmiadzin. Having heard all this, the people set out to bring in materials. With haste and reverence one brought stones, the other tiles, bricks, wood, etc. The laying of the foundation and construction of St. Etchmiadzin, as well as the martyriums of the Hripsimians, Kayanians, and Shoghagat, all take place by the collaboration of the people in an enthusiastic atmosphere. In later centuries, these initial structures undergo remodeling. It is worthy to note also that at the same time that the enthusiastic construction was taking place, statues and temples of pagan idols were being destroyed throughout the land. Here we note that the thinking and standards of the time being much different than they are today, there were no doubt numerous interesting and valuable handmade works which were destroyed, works which today would be considered museum quality and of national value. Politically, it was a peaceful period for Armenia. 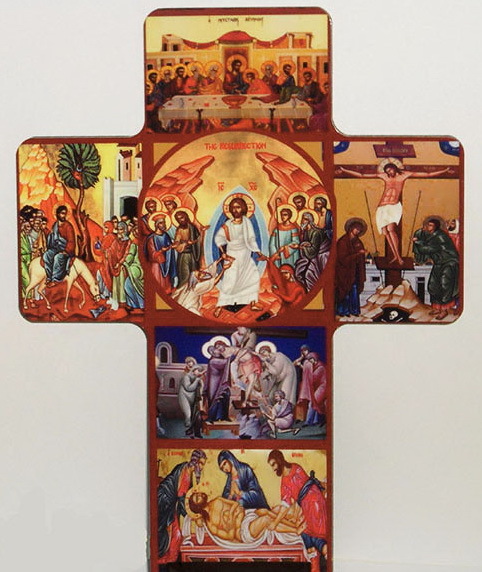 After the foundation of the Mother Cathedral was set, the entire nation adhered to Christianity. People from all regions went to Vagharshabad to learn about the new faith. The King enthusiastically welcomes and supports the rise of the new faith and church construction projects. He invites princes, provincial heads, generals, judges, and other leaders to the royal palace to lead Gregory to Caesarea with a royal envoy to be ordained as the spiritual head. The signed decree is sent to Patriarch Ghevontios of Caesarea. The ordination of Gregory is conducted with great pomp. The royal delegation, soldiers and faithful, accompany the newly ordained Pontiff back to Vagharshabad, on the way stopping in hundreds of villages and cities for celebrations. A festive atmosphere reigns throughout the land, especially in Vagharshabad, the capital city of St. Etchmiadzin. Apart from the notable Feast of St. Etchmiadzin, the Armenian Church also observes the founding of the Hripsimian and Kayanian churches, which is commemorated together with the memory of the saints on two consecutive days the week preceding the Feast of St. Etchmiadzin. The Feast of St. Etchmiadzin is observed two weeks after Pentecost. – The mother church of a community, where the Pontiff resides. – Catholic text signifies “belonging to all”, such as the writings of the Apostles.